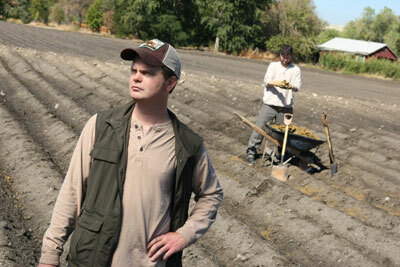 Remember a year ago when NBC announced they were developing an Office spinoff starring Dwight called The Farm? Yeah, at the time, we didn’t believe it would happen either. But with The Office finally coming to a close this season, NBC seems desperate to establish another hit comedy (or at the very least the NBC equivalent of a hit comedy). And why actually take the time to develop a comedy, when you can just make a spin-off via a backdoor pilot! NBC: Easier is ALWAYS Better. So former Office showrunner Paul Liberstein has the go ahead, and is currently casting the spin-off, mostly centered around Dwight’s intermediate family. Find out who will be playing them in this certain…err, “hit” after the jump. The Campaign star Thomas Middleditch will play Dwight’s brother, the “oddball” Jeb. Matt Jones (Badger from Breaking Bad) will play Dwight’s cousin, Zeke, who’s wacky character traits are still unknown at this time. And Blake Garrett will play his nephew Cameron, who I’m sure Dwight will form a cute and caring bond with, because why else would he exist? The role of Dwight’s crazy Nazi uncle will be played by Tom Bower of Die Hard 2 fame. Seriously, you can’t make this stuff up. For those who are inclined (and for people like me who are practically required to watch it), you can get a taste of the crazy Schrute family shenanigans when all these actors will guest star on an upcoming episode of The Office, in what I’m sure will be a graceful and logical introduction. NBC: With Us, the Jokes Practically Write Themselves.